“I was born in Srinagar and have lived the first half of my life in the same city in very peaceful times. I got married to a Pakistani and I have been living in Islamabad for the last twenty-two years. I have been following the remarkable effort by the two leading newspapers of Pakistan and India which offers a ray of hope for people like me. Though I am a Pakistani national now, every time I have applied for visa for Jammu and Kashmir, it has been a marathon and with each passing mile the intricacies of the procedure have increased. My father is a retired Indian Administrative Service (IAS) officer. When he was in good health he used to go himself to the secretariat to facilitate my visa. But now he is old and cannot do so. Nobody can realise the plight of women like me who are divided from their families. It's very difficult for them to acquire visa and many years elapse before they get to meet their families. Most of the time it is nirasha rather than asha for us. I can go to the Indian High Commission even twice a day if I have to as I live in Islamabad. But what about the people who come from far off places? For these poor people even the cheapest fare is too much at times. The embassies of both countries try to give visa on humanitarian grounds on death of a relative depending on the visa officer in charge. But what good is a dead body if we are not able to see the same person alive? 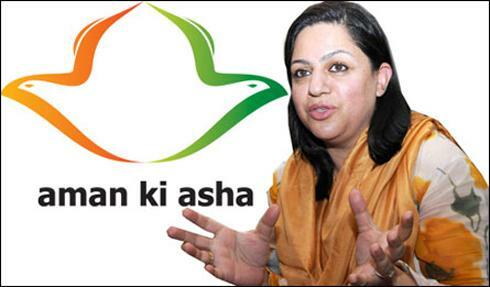 What does one have to do to be an active member of the Aman ki Asha? I am not a journalist or a singer or a musician. I am a homemaker whose parents and relatives live on the other side of the Line of Control. And there are many like me, separated from our loved ones by solid, imaginary lines drawn at the cost of our peace of mind. I hope that the leaders and politicians of both countries understand the aman ki bhasha and make this initiative a reality. We, the undersigned, are sending this petition to you on behalf of the divided families of the two countries. * For a Pakistani, a normal visa to any city in India takes three to four weeks to process. But visas for the disputed territory of Jammu and Kashmir take a year to process. The clearance has to come from J&K state police and IB department in Srinagar. Then it goes to Delhi IB and to the Kashmir desk (North block, New Delhi). It is forwarded to Ministry of Home Affairs, (MHA) Foreigners section. And then it is conveyed to Indian High Commission in Pakistan. It is almost the same for Indians applying for Pakistan. Please do something to reduce this excruciating time frame. There is too much paperwork involved in applying for a visa. * We need an affidavit, valid only for forty five days, which has to be obtained from the city to be visited. * We need any two current [utility] bills. * Finally, a no objection from the organisation you are working for or if self employed then your business registration letter. We are positive something can be done to reduce the paperwork and make things easier for people. Some points are listed below. * Infants and children under thirteen should be exempted from police reporting. * There should be Indian and Pakistani consulates in other cities besides Delhi and Islamabad only. * The visa fees are only about fifteen rupees on both sides. But getting to the respective embassies costs many times more. If one piece of paper is incorrect or missing, applicants have to come again and again, which is particularly disheartening for the poor and unlettered. * India has introduced a condition that restricts foreigners from returning to India for sixty days unless they visit a neighbouring country and have a valid ticket back to India. There is no concept of re-entry to India otherwise. * In both countries, visa extensions and long term visas are very difficult to obtain. This makes life particularly difficult for married women with families across the border. * If a mother has Indian or Pakistani nationality, her children should be given visas to her home country without any obstacles no matter what their nationality. * Visas of Pakistani and Indian nationals married to each other should be made easier. The requirement of getting names of spouses added to the respective passports is another tough task. * Pakistani nationals living in other countries, even if they have citizenship of another country and are living abroad, find it very difficult to obtain visas for India, and vice versa. * Exit and entry points are fixed. These are changed with great difficulty. If the places to be added or visited not in the order that is on the visa, that is another ordeal. Please make travel more flexible as upheavals of nature can strike any time any place. * Functioning of embassies and consulates should be like well oiled machines which are regularly updated. Clerical errors which cause undue problems to the applicant should be rechecked and avoided. There should be a 24-hour helpline to give information as required. These are some totally avoidable obstacles faced by the people who live on the opposite sides of the fence. We request the leaders and those at the helm of affairs to step into our shoes and feel the pain of the divide. Only by empathising can these shortfalls be corrected. In anticipation of redress for these easily rectifiable problems, we thank you. Despite cognitively knowing that no change may materialize by the mere petition-writing of the ordinary homemaker, Nazima Babar Reshi still went ahead with it! She took that plebeian's first incorrigible baby-step to stop being a silent spectator waiting for Allah, to stop being an idle bystander looking from the side with the oft recited proclamation 'what can I do! ', and took a public position to boldly seek her problem resolution from the very mercurial rulers who whimsically decide the fate of nations! Viva Activism! Imagine if a million such ordinary peoples got out of their shells of apathy and began to take extraordinary public stances on their daily troubles, hopes, and aspirations! Imagine that they not only rationally articulated the problem domain as Nazima Babar Reshi has done above, but also outlined sensible resolutions to those problems just as she has done? Imagine that they followed up with the next baby-step of forming public-interest organizations capable of pushing those solution-spaces nationally and internationally? Imagine that they purchased media time and brought their conversations to the forefront of public discussions? Imagine that they took the next baby-step of mobilizing both peoples and financial resources to drive the issues to the point that the politicians who turn on a dime could not ignore them? Imagine that they learned to harness the same courts used by the state-actors for legalizing their oppression of the peoples? Even the all powerful history's actors – expert at pitting nations against nations and peoples against peoples in world wars by diabolically sewing Machiavellianly constructed revolutionary times with fabricated enemies, artificial threats, contrived dangers, and of course the shock and awe visitations by both the emperor's pirates and his imperial storm-troopers as the Hegelian pretexts for justifying Global Governance in baby-steps designed to culminate in a one-World Government – surely could not withstand such a determined onslaught by a million resolute homemakers in the United States of America! And ten million homemakers worldwide getting out of their kitchens of apathy and onto the trail of activism, well, might just change the world!